"Hyte, 2003.08.1108[a], Burial 2" by Timothy K. Perttula and Robert Z. Selden Jr.
DECORATION (INCLUDING MOTIF AND ELEMENTS WHEN APPARENT): The rim panel has an engraved interlocking horizontal scroll motif repeated four times around the vessel. The dividers between the motifs are cross-hatched brackets; smaller cross-hatched brackets serve to interlock the scrolls. Ripley Engraved, var. 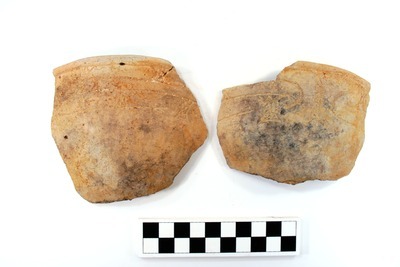 Pilgrims carinated bowl rim sherds, Burial 2, Hyte site.